BERGHAUS MATTERHORN, starting point for alpinists climbing Matterhorn via Hörnligrat/Zmuttgrat or the North Face, is situated at 10,700 feet. It was built by the Commune of Zermatt in 1911. The original Hörnlihütte was built by the Swiss Alpine Club (Monte Rosa Section) in 1880. In 1965 this cabin was pulled down and rebuilt. In 1983, the two buildings were both placed under the management of the Matterhorn Group. In 1915 the Solvay Hut (emergency bivouac) was built at a height of 13,130 feet. The first alpine shelter was constructed at 12,500 feet by the hotelier Seiler and the Swiss Alpine Club (Monte Rosa Section). 1857 The race to conquer the Matterhorn began in 1857, when Jean-Jacques Carrel, Jean-Antoine Carrel and Amé Gorret attempted to climb the mountain. They planned to climb via the Tête du Lion, but soon had to abandon their ascent because the ridge was too steep. 1858 Jean-Jacques and Jean-Antoine Carrel undertook a further attempt  this time from the Italian side instead of Tête du Lion. However, at a height of 12,500 feet they once again encountered a very steep passage that proved insurmountable. 1860 This time Jean-Jacques Carrel was accompanied by the English climbers John Tyndall and Hawkins and the mountain guide Bennen. Starting out from Breuil, they succeeded in climbing up to the big tower. The Parker brothers twice tried to climb the Matterhorn from the Zermatt side, but they too had to abandon their project at an altitude of 11,800 feet. 1861 The English alpinist Edward Whymper made an unsuccessful attempt to climb the Matterhorn from Breuil. 1862 Following five further unsuccessful attempts and a fall of 200 feet, Whymper temporarily abandoned his project. John Tyndall, with the mountain guide Bennen, Anton Walter, Jean-Jacques and Jean-Antoine Carrel, reached the first part of the peak, nowadays called Pic Tyndall. 1863 Whymper, the Carrel brothers and their companions suffered the same setback as the previous year. The mountain remained unconquerred. 1864 The calm before the storm. This year, there were no attempts to climb the Matterhorn. 1865 On the morning of 13 July 1865 Michel Croz, Peter Taugwalder and his son, Reverend Charles Hudson, Lord Francis Douglas, Robert D. Hadow and Edward Whymper departed from Zermatt in the direction of the Matterhorn. The group camped for the night at a height of 11,000 feet. In the early afternoon of 14 July 1865 they reached the summit of the Matterhorn, until then unconquerred. The descent proved long and perilous  particularly with the inexperienced Hadow. At a moment he lost his grip and fell, pulling Croz, Hudson and Lord Douglas with him. Edward Whymper and Taugwalder used all their force to belay the rope and stop the companions' fall, but the rope broke between Taugwalder and Lord Douglas... On the next day the remainder of the group, Whymper, Taugwalder and his son, returned to Zermatt. 1868 J. Tyndall, accompanied by J. and D. Marquinaz, climbed the Matterhorn from Breuil. 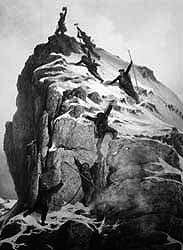 1890 Whymper's adversary and former companion Jean-Antoine Carrel died of exhaustion on the Matterhorn. 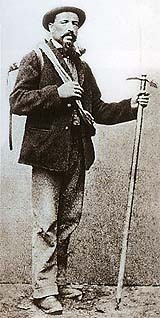 1911 Edward Whymper, the first to climb the Matterhorn, died in Chamonix. (по материалам вебстраницы высокогорной гостиницы "Бергхаус Маттерхорн / хижина Хорнли"
"Бергхаус Маттерхорн", отправная точка для восходителей на Маттерхорн по ребрам Хорнли и Цмутт и по Северной стене, находится на высоте 3260 м [у основания гребня Хорнли]. Он был построен коммуной города Церматт в 1911 г. Самая первая хижина "Хорнлихютте" была сооружена Швейцарским альпийским клубом (отделение Монте Роза) в 1880 г.. В 1965 г. она была снесена и построена заново. В 1983 г. оба здания переданы под управление объединения "Группа Маттерхорна". В 1915 г. на высоте 4000 м [на плече гребня] была сооружена спасательная хижина "Сольвей". Первый альпийский приют [на Маттерхорне] на высоте 3810 м был построен в 1868 г. Зайлером, который занимался гостиничным бизнесом, и отделением Монте Роза Швейцарского альпийского клуба. 1857 Соревнование за победу над Маттерхорном началось в 1857г., когда братья Жан-Жак и Жан-Антуан Каррели вместе с Амé Горрé попытались подняться на гору. Они собирались пройти через Львиную Голову, но вскоре прекратили восхождение, потому что гребень был слишком крут. 1858 Жан-Жак и Жан-Антуан Каррели предпринимают следующую попытку  в этот раз не через Львиную Голову, а с итальянской стороны. Однако, на высоте 3810 м они снова встретили очень крутой участок, оказавшийся непреодолимым. 1860 На этот раз Жана-Жака Карреля сопровождали английские восходители Джон Тиндаль и Хоукинс и высокогорный гид Беннен. Начав из Брейля, они смогли добраться до вершины большой башни на гребне. Братья Паркеры дважды пытались взойти на Маттерхорн со стороны Церматта, но они тоже были вынуждены отказаться от своей идеи на высоте 3600 м. 1861 Английский альпинист Эдуард Уимпер сделал неудачную попытку подняться на Маттерхорн из Брейля. 1862 После следующих пяти неудачных попыток и падения на глубину 60 м Уимпер временно отказался от своего проекта. Джон Тиндаль с гидом Бенненом, Антоном Вальтером, Жаном-Жаком и Жаном-Антуаном Каррелями достигает плеча предвершинного гребня, ныне называемого пиком Тиндаля. 1863 Опять, как и в прошлом году, Уимпер, братья Каррели и их компаньоны потерпели неудачу. Гора осталась непокоренной. 1864 Затишье перед бурей. В этом году не было попыток восхождения на Маттерхорн. 1865 Утром 13 июля 1865 г. Мишель Кро, Петер Таугвальдер и его сын, преподобный Чальз Хадсон, лорд Френсис Дуглас, Роберт Хэдоу и Эдвард Уимпер вышли из Церматта к Маттерхорну. Группа остановилась на ночной бивуак на высоте 3350 м. Вскоре после полудня 14 июля они достигли вершины Маттерхорна, доселе непокоренной. Спуск оказался долгим и опасным  в особенности для неопытного Хэдоу. В какой-то момент он потерял точку опоры и упал, стащив за собой Кро, Хадсона и лорда Дугласа. Уимпер и Таугвальдер изо всех сил старались остановить падение своих компаньонов при помощи веревки, но она лопнула между Таугвальдером и лордом Дугласом... На следующий день остатки группы  Уимпер, Таугвальдер и его сын  спустились в Церматт. 1868 Тиндаль поднялся на вершину Маттерхорна из Брейля в сопровождении Ж. и Д. Маркинацев. 1871 Первая альпинистка на Маттерхорне: Люси Уолкер. 1890 Бывший соперник Уимпера и бывший его компаньон Жан-Антуан Каррель умер от истощения при восхождении на Маттерхорн. 1911 Эдуард Уимпер, первый восходитель на Маттерхорн, умер в Шамони. 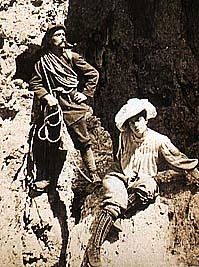 mountain guide Arcangelo Siorpaese from Cortina and British alpinist Beatrice Tomasson, organizer of the group having first climbed north wall of Marmolada in Dolomite Alps. проводник Арканджело Сьорпаезе из Кортины и британская альпинистка Беатрис Томассон  организатор группы, проложившей первый маршрут по северной стене Мармолады (Мраморная - итал. ),  в Доломитовых Альпах. Edward Whymper was born in 1840 in London. Professional painter-engraver, he was one of those who laid the foundations of a special relation to the alpinism as a sport activity when a person involved into struggle against the mountain nature elements reaches a limit of his abilities, comes to the edge of death or life. For the first time Whymper came to the Alps in 1860 as painter. In 1861 he took part in a British expedition already as climber and summited Pelvoux in the French Alps. In 1864, jointly with Adolfus Moor and the best mountain guides of that epoch, Christian Almer from Grindelwald and Michel Croz from Chamonix, he climbed up Écrins until then unconqerred. In June 1865 Whymper realized two outstanding ascents in Chamonix: Grandes Jorasses  jointly with Croz, Almer and Franz Biner [two summits of that massif famous with its formidable north wall bear names of Croz and Whymper], and Aiguille Verte  in rope team with Almer and Biner. However, it was Matterhorn that played a quite particular role in his life. Huge obelisk of Matterhorn stands in Pennine Alps at the Swiss-Italian border. Four ridges converge to its top towering by 1000-1200 vertical meters above surrounding glaciers. They confine four vast, almost vertical walls swept with avalanches and stone falls. Not over glaciers and firn fields the ways to its summit go, as it occurs on Mont Blanc or on Monte Rosa, but on steep and dangerous, erroded rocks. Assaults of Matterhorn had been begun as early as in 1857 but only in 1865 the summit had been reached for the first time. During that period 8 Britishes and 22 guides had insuccessfully attempted its top 18 times in total, with 15 among them being from Breuil, along South-West, Italian Ridge and 3 ascents  from Zermatt in Switzerland. 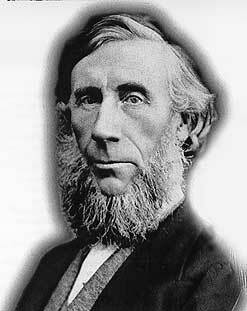 Famous physicist, John Tyndall and Edward Whymper were the most obstinate of British alpinists. 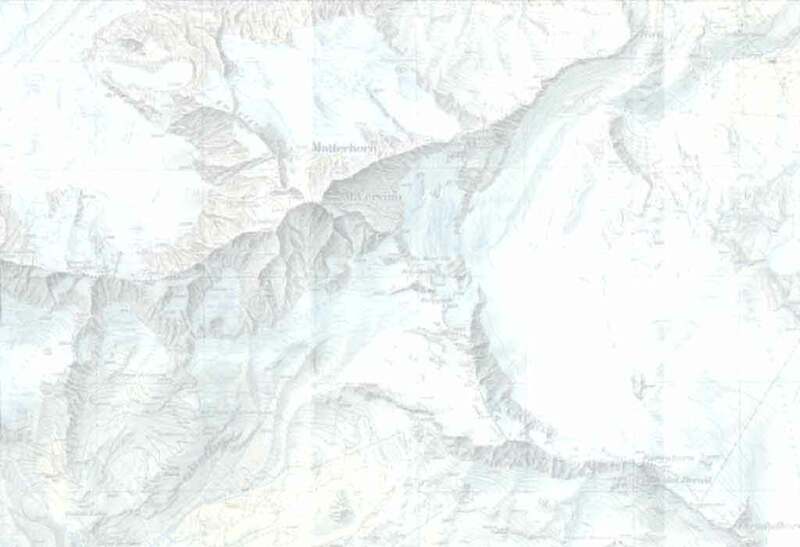 For 5 years from 1861 to 1865 Whymper had made eight attempts of Matterhorn along the Italian Ridge but did not succeed. At one of them hе was saved only by a miracle after fall into a snow couloir. And it happened that most often Jean-Antoine Carrel, mountain guide from Breuil in Aosta valley was his companion. After a number of years Whymper acquired considerable mountaineering experience, conquerred many Alpine tops, but Matterhorn was the mountain that still lured him with irresistible force. Having come to Aosta from Chamonix in July 1865, Whymper pressed Jean-Antoine to attempt the Matterhorn from Zermatt, along easier North-East Ridge. Carrel hesitated  he preferred to climb the mountain along better known South-West rib... July 12 Whymper learned unexpected news from Favre, hotelier in Breuil  Jean-Antoine Carrel jointly with his brother, with Felice Giordano, Italian geologist, and Sella, Italian Government Minister and uncle of prominent italian alpinist and photographer Vittorio Sella, were set to conquer the Matterhorn: Monte Cervino must be Italian! Many times Whymper and Carrel tried to reach the summit as companions but at this time a keen rivalry flared up between them for the honor of the first ascent. Эдуард Уимпер родился в 1840 г. в Лондоне. Художник-гравер по профессии, он был одним из основоположников особого отношения к альпинизму, как к спортивному занятию, когда человек в борьбе с природой гор доходит до предела своих возможностей, оказывается на краю жизни и смерти. Впервые Уимпер приехал в Альпы в 1860 г. в качестве профессионального художника. В 1861 г. он выступает уже как горовосходитель и в составе британской экспедиции поднимается на Пельвý во Французских Альпах. В 1864 г. вместе с Адольфусом Муром и двумя лучшими высокогорными гидами того времени, Мишелем Кро из Шамони и Кристианом Альмером из Гриндельвальда, совершает восхождение на дотоле непокоренный Экрéн. В июне 1865 г. Уимпер делает два выдающихся первовосхождения в Шамони: вместе с Кро, Альмером и Францем Бинером  на Гранд-Жорасс [две вершины из четырех этого массива, широко известного своей грозной северной стеной, носят имена Кро и Уимпера], и с Альмером и Бинером  на Эгюий Верт. Но Маттерхорн играл в его жизни совершенно особую роль. Маттерхорн мощным обелиском возвышается в Пеннинских Альпах на границе между Швейцарией и Италией. К его вершине, на 1000-1200 м возвышающейся над окрестными ледниками, сходятся четыре гребня, ограничивающих четыре огромных, почти отвесных стены, пробиваемых лавинами и камнепадами. Пути к его вершине проходят не по ледникам и фирновым полям, как на Монблане и Монте-Розе, а по крутым и опасным, разрушенным эрозией скалам. Осада Маттерхорна началась в 1857 г., но вершина была достигнута впервые лишь в 1865 г. За эти годы восемь англичан и 22 гида предприняли в общей сложности 18 безуспешных попыток достичь вершины. Пятнадцать из них были по юго-западному итальянскому гребню из поселка Брейль, а три из Церматта в Швейцарии. Из британских альпинистов наибольшее упорство проявляли известный физик Джон Тиндаль и Эдуард Уимпер. За пять лет с 1861 по 1865 г.г. Уимпер предпринял восемь безуспешных попыток восхождений на Маттерхорн по итальянскому гребню. Чудом остался жив после падения в снежный кулуар во время одной из них. Чаще всего его напарником по восхождениям был гид из Брейля в долине Аосты Жан-Антуан Каррель. За эти годы Уимпер покорил много альпийских вершин, приобрел солидный горовосходительский опыт, но Маттерхорн продолжал его манить с неудержимой силой. Прибыв в Аосту из Шамони в июле 1865 г., Уимпер настойчиво уговаривал Жана-Антуана попробовать сделать восхождение из Церматта, по более простому Северо-Восточному гребню. Каррель колебался  ему хотелось подняться с итальянской стороны, по хорошо знакомому ему Юго-Западному гребню... 12 июля Уимпер узнал от владельца гостиницы в Брейле, Фавра, неожиданную новость: Жан-Антуан Каррель со своим братом, с итальянским геологом Феличе Джордано и с министром итальянского правительства Селлой (дядей известного итальянского альпиниста-фотографа Витторио Селла) вышли из Брейля на Маттерхорн по итальянскому гребню  Монте Червино должна быть итальянской! Много раз Уимпер и Каррель пытались достичь вершины вместе, в этот раз между ними разгорелось острое соперничество за честь первого восхождения. Together with another British alpinist, Lord Francis Douglas, Whymper hurried off to Zermatt, taking the Theodul Pass. In Zermatt he organized a team for the Matterhorn in which two local guides, two Peters Taugwalders, father and son, took part. It was at the Hotel Monte Rosa that they met the avid and experienced climber Reverend Charles Hudson, the Anglican Church pastor. Famous Michel Kroz who climbed Grandes Jorasses jointly with Whymper a couple weeks ago had been engaged by Hudson as the gude. 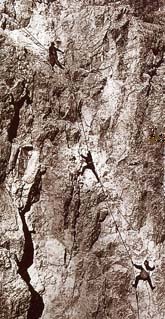 The third in that group was Robert D. Hadow, twenty-years-old Hudson's friend and beginner in climbing. Both the groups decided to combine their forces. On the morning of 13 July 1865 the joint Whymper group set out from Zermatt in the direction of the Matterhorn. They camped for the night at a height of 3350 m. On the next morning the ascent had been continued. At the middle part of the route Whymper and Douglas were leading alternatively, experienced Croz was leading on the summit tower. In the early afternoon of 14 July 1865 Michel Croz, both Taugwalders, Reverend Charles Hudson, Lord Francis Douglas, Robert D. Hadow and Edward Whymper were standing, at last, on the summit of the Matterhorn, until then unconquerred. Far below them, they spotted the Italian climbers. In euphoria, they commenced on to cry and to throw stones in direction of the rivalry team. Having seen Whymper's group from their route, Italians, disappointed, turned down. It were Tauwalders and Whymper who remained on the Ridge. Hardly Whymper could force his demoralized companions to continue descending. 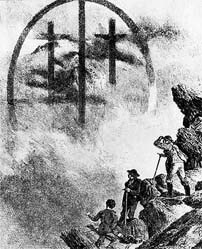 Later, Whymper reported in his memoirs (E. Whymper, Scrambles amongst the Alps, 1871) that at some instant they were seeing a strange apparition on cloud surface: two huge crosses in a commom circle. After a torturous night bivouac on the Ridge rocks, the broken-down climbers returned to Zermatt. Вместе с другим английским альпинистом, лордом Френсисом Дугласом, Уимпер немедленно поспешил в Церматт через перевал Теодуль. Там он организовал группу, в которую кроме него и Дугласа вошли местные проводники  два Петера Таугвальдера, отец и сын. В отеле "Монте Роза" Уимпер и Дуглас встретились с также направлявшейся на Маттерхорн группой страстного любителя альпинизма, опытного горовосходителя, пастора англиканской церкви, преподобного Чарльза Хадсона. В качестве гида Хадсон нанял великого Мишеля Кро, который пару недель тому назад был вместе с Уимпером на Гранд-Жорассе. Третьим в этой группе был двадцатилетний друг Хадсона, новичок в горовосхождениях, Роберт Д. Хэдоу. Обе группы решили объединить усилия. Утром 13 июля 1865 г. объединенная группа Уимпера, состоявшая теперь из семи восходителей, вышла к Маттерхорну из Церматта. На высоте 3350 м, в основании Северо-Восточного гребня они устроились на ночной бивуак. На следующее утро восхождение было продолжено. В средней части маршрута попеременно лидировали Уимпер и Дуглас, вершинную башню первым проходил опытный Кро. Вскоре после полудня 14 июля 1865 г. Уимпер, Кро, Хадсон, Дуглас, оба Таугвальдера и Хэдоу стояли, наконец, на вершине Маттерхорна. Далеко внизу они заметили группу Каррелей. В опьянении своей победой Уимпер и его спутники принялись кричать и бросать камни в сторону своих соперников. Увидев их со своего маршрута, итальянские восходители, в расстройстве, повернули назад. На гребне остались Таугвальдеры и Уимпер. С трудом последнему удалось заставить своих деморализованных спутников продолжить опасный спуск. Уимпер писал в своих воспоминаниях (Восхождения в Альпах, 1871 г. ), что в какой-то момент на поверхности облаков они увидели странное видение: два огромных креста в одном общем круге. После тяжелого ночного бивака на скалах гребня морально сломленные восходители спустились в Церматт. 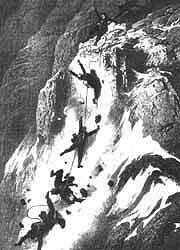 Gustav Doré's graphic representation for the first Matterhorn ascent and disaster. Гравюры Гюстава Доре о первом восхождении на Маттерхорн и произошедшей на нем катастрофе. Edward Whymper. Ghost of Matterhorn. Эдуард Уимпер. Видéние на Маттерхорне. 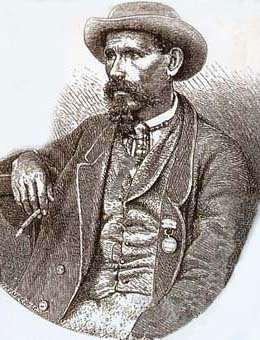 Three days after Whymper's climb, Carrel had also reached the top  that was 19th attempt on the Italian Ridge, the successful one this time. After his tragic exploit, Whymper came out of the rush for first ascents of great Alpine summits. A number of years passed and Whymper became reconciled with Carrel, they climbed up Matterhorn together, in 1890 they travelled together in the Andes, in Ecuador, having made the first ascent of Chimborazo (5897 m) and the third one of Cotopaxi (6267 m). Через три дня после восхождения Уимпера Каррель также достиг вершины  это была 19-я попытка по итальянскому гребню, успешная на этот раз. После своего трагического восхождения Уимпер вышел из гонки за первовосхождениями на великие вершины Альп. С годами Уимпер и Каррель помирились, вместе поднимались на Маттерхорн, в 1880 г. вместе путешествовали в Андах, в Эквадоре, совершив первое восхождение на Чимборасо (5897 м) и третье на Котопакси (6267 м). 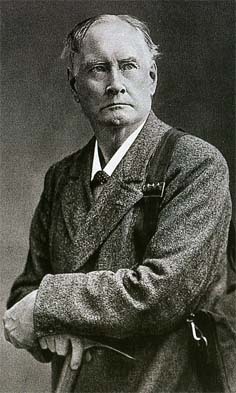 Carrel perished in 1890 when he was 62 years old. Не died of exhaustion and cold in blizzard on the Italian Ridge during his 50th ascent of the Matterhorn. Just before his death he managed to bring his two clients to a safety thus having saved their lives  the worthy end! 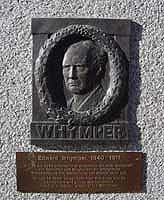 Whymper died in 1911 in Chamonix. Каррель погиб в 1890 г., когда ему было 62 года, от истощения и переохлаждения в метель на итальянском гребне во время своего пятидесятого восхождения на Маттерхорн. Перед своей смертью он успел вывести в безопасное место и спасти от гибели в этой пурге двух своих клиентов. Достойный конец! Уимпер умер в 1911 г. в Шамони. Composed and translated by S. Kalmykov. Составлено и переведено С. Калмыковым.